Home > Questionnaires > Questionnaire: Can You Tell Recycling Fact from Fiction? Open the paper, click on a web site or listen to the TV and you’ll find yourself being bombarded with statistics, facts and trivia about recycling. A lot of it is really helpful and allows us to begin to get a grasp of the scale of the problem, even if we’ve never actually visited a recycling plant, or seen a landfill site. Few people have any sort of an idea what 30 million tonnes of waste really looks like – but talk about filling up an area the size of Lake Windermere and instantly we’ve all got the picture. That’s all well and good, but how do you tell a genuine fact, from a great big fib? Is the UK’s waste really equivalent to the weight of three and a half million London buses or not, and could they actually form a queue that could circle the earth twice over – or only once? The trouble with all this kind of stuff is knowing what’s true, and what isn’t. As Mark Twain famously wrote, “there are lies, damned lies and statistics” – the trick is, of course, knowing which one you’re being presented with at any given time. So, can you tell recycling fact from fiction? Here’s a quick little quiz to help you find out; the idea’s very simple, just have a look at the following statements and decide which ones sound right to you. The answers are at the end – so good luck. 1. On average we throw away nearly 140kg of food per person every year. 2. Composting makes up less than 3% of the UK recycling effort. 3. Recycling is always the most environmentally beneficial option. 4. The UK recycling rate has more than doubled since the year 2000. 5. Britain produces nearly double the EU average amount of waste per person per year. 6. If you collected all the plastic bags given away in the UK over a year, you could cover the whole of London. 7. About £3 million of aluminium is thrown away every year in the UK. 8. If all of the UK’s waste aluminium was recycled, we’d need 14 million fewer dustbins. 9. Every Christmas enough wrapping paper is thrown away to more than paper over the island of Guernsey. 10. If the average household stacked the glass bottles and jars it used in a single year, one on top of another, it would reach as high as the summit of Snowdon. 1. True – that’s an annual UK total of 8.3 million tonnes of wasted food. 2. 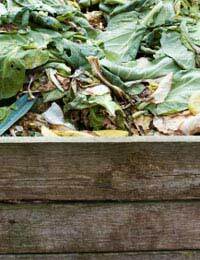 False – according to official figures, composting accounts for over 34% - and it’s rising. 3. False – sometimes it isn’t sensible to try to recycle some sorts of materials, particularly if they need to be transported a long way for reprocessing and reusing things yourself rather than recycling them can often be the greenest thing to do. 4. True – back then it was only around 9%. 5. False – we do produce more, but only slightly. The UK average of 592 kg/year is 15kg higher. 6. False – actually you could cover London not once but TWICE with all those bags, 17.5 billion of them, according to estimates! 7. False – incredibly, it’s more than ten times that amount, a staggering £36 million worth! 8. True – amazingly, it has been estimated that we would indeed fill 14 million fewer dustbins. 9. True – around 83 square kilometres of the stuff is binned every Christmas! 10. False – each household uses about 500 in a year; the stack might stretch to around 150 metres or so, but it hardly rivals the snow capped 1085 metres of Wales’ tallest peak! 6 to 9 – Pretty clear! 3 to 5 – Not quite sure! 0 to 2 – Give us a clue!